THE PICKIEST EATER IN THE WORLD: BEEFY'S NEW YORK GRILL: A BITE OF THE BIG APPLE AT LAGUNA! 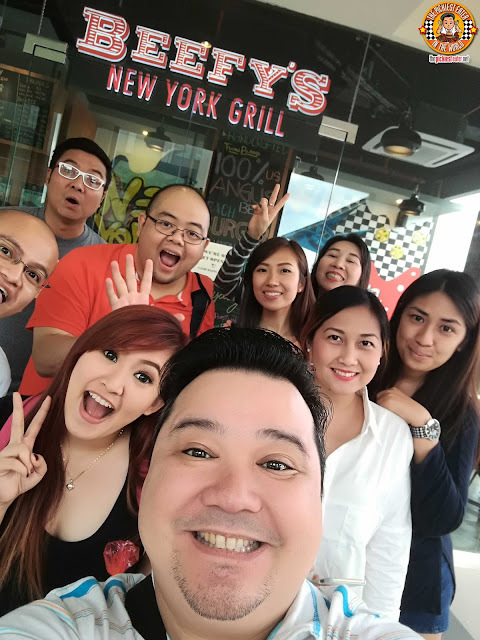 BEEFY'S NEW YORK GRILL: A BITE OF THE BIG APPLE AT LAGUNA! I rarely find myself down South, which I know is sad because there are tons of places to discover from BF Homes, all the way down to Tagaytay.. Further even! However a restaurant in Laguna opened late last year, which piqued my curiousity. 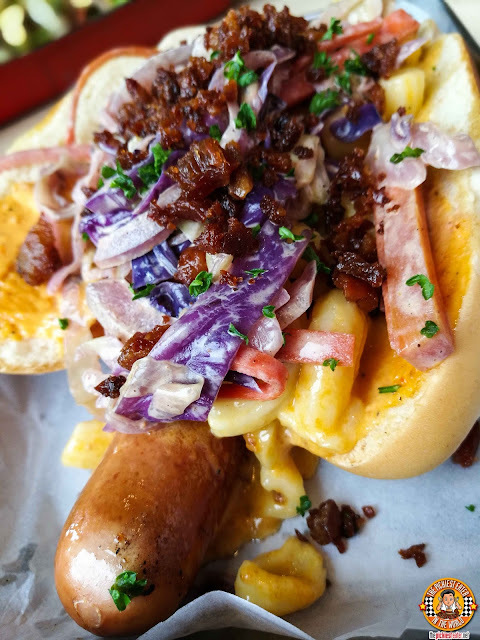 A quick glance at Beefy's New York Grill Facebook page showed insane looking burgers and dawgs, that was more than enough to get my taste buds excited! So one fine Sunday, some of my foodie friends and I hopped on to Food in the Bag's car and made our (surprisingly) smooth trek to Solenad 3 in Nuvali, Laguna! 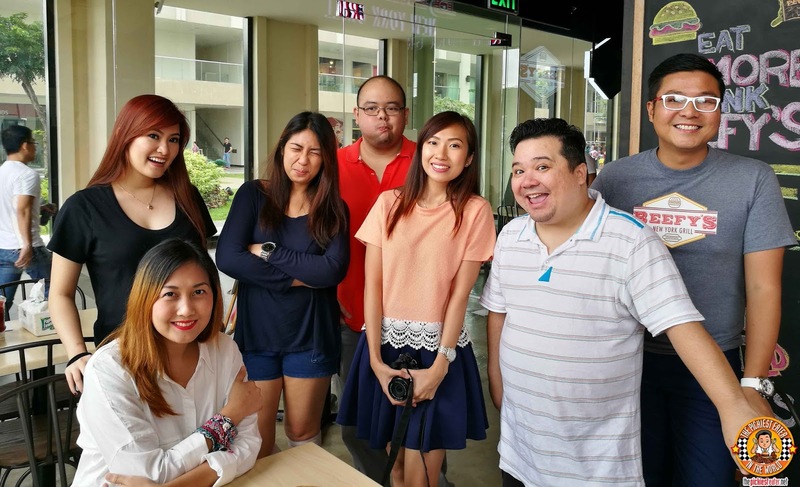 I knew we were in for a treat even before stepping in to Beefy's simply because one of the main brain thrusts behind the restaurant, namely Chef Marc Nocon, is also one of the brilliant minds behind another one of my favorite Burger spots, Burgers and Brewskies (of my Web Series Fame hehe)! 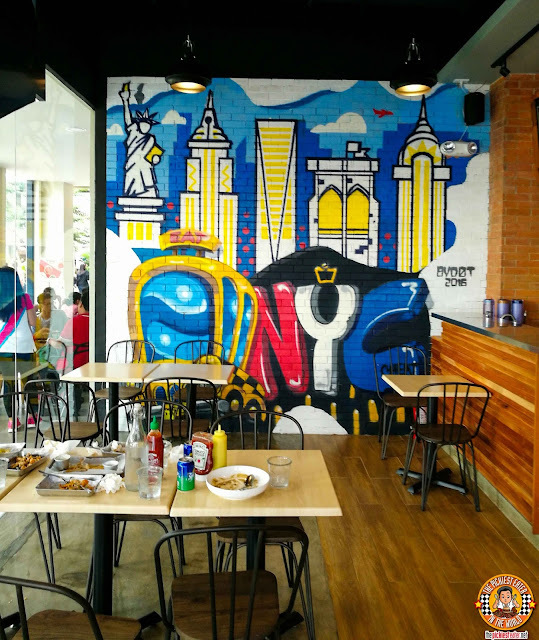 With New York Themed graffiti adorning the brick wall interiors, the vibe invokes the Big Apple, and sets the stage for what you can expect to be an amazing meal. Proof that Chef Marc gets me.. 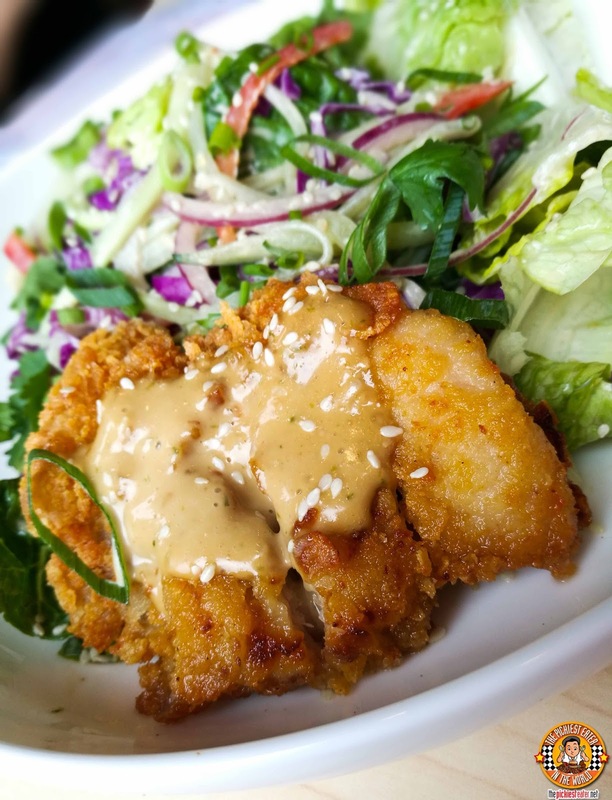 He slapped on a deep fried chicken fillet to a salad and called it The Mrs. Tso Salad (P160), The salad itself was made with a mixed Chopped Romaine Lettuce, tossed in with Sweet Peppers, Onions, and a healthy drizzling of Sriracha dressing. Kudos to Beefy's for making a salad that I'd be willing to eat, however the Spam Chips (P180), was much more up my alley. 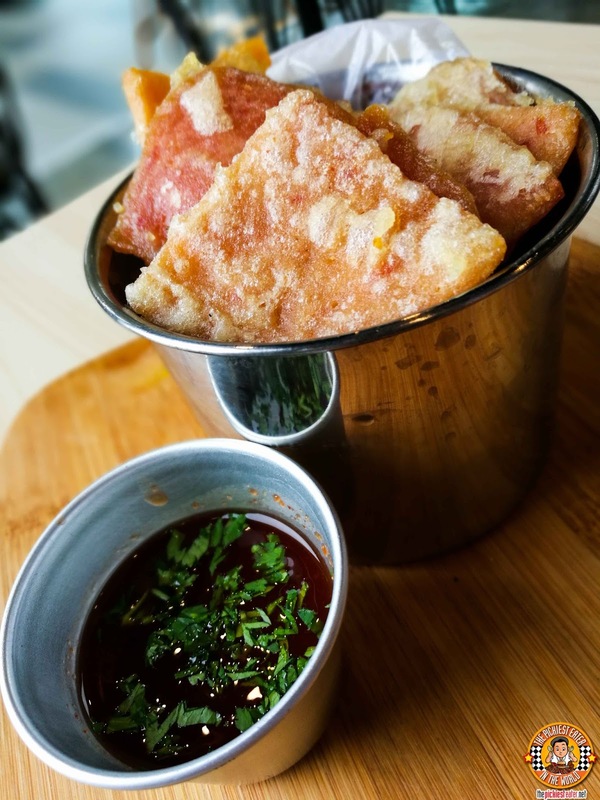 Slices of everyone's favorite luncheon meat, dipped in a light batter and deep fried, was incredibly comforting, but when you dip it in the honey and black pepper mustard, it gives you a uniquely delicious take on a classic favorite. What really got me going was the East Village Bacon Tempura (P180). 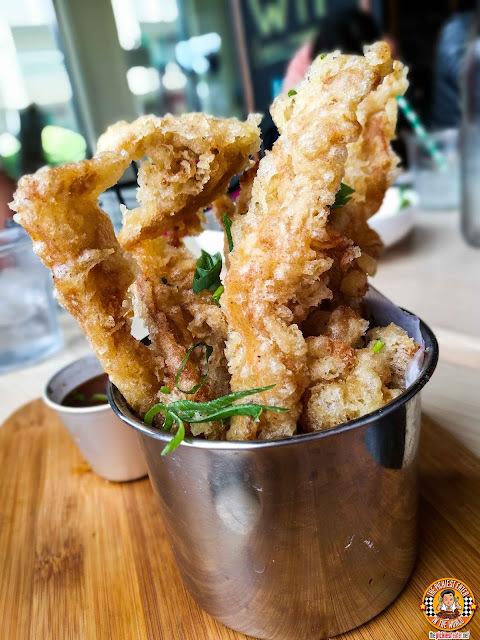 Strips of Bacon were dredged in a Japanese Batter and deep fried to a glorious golden hue, and served with a Sriracha honey vinegar.. This brought my taste buds to whole new realms of pleasure I never knew existed. The Chimichurri Fries (P220) offered delicious explosion of flavors. 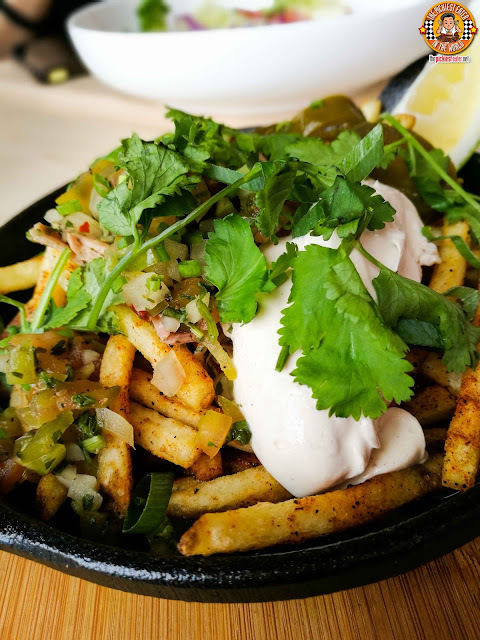 Fries mixed with Braised Pork Belly, Salsa, a robust homemade Chimichurri, that is perfectly balanced by a dollop of Sour Cream. 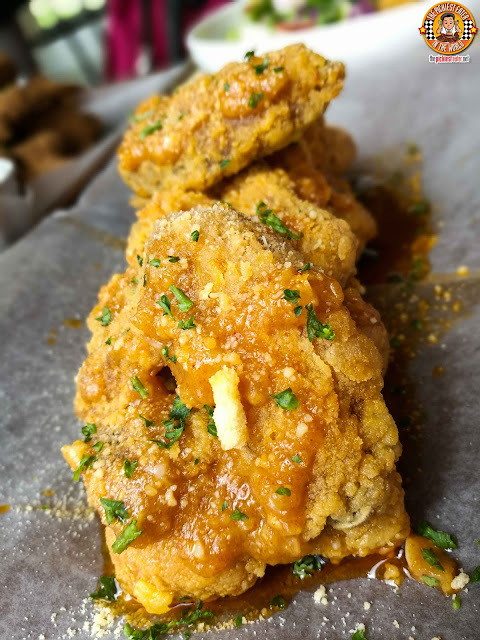 The Garlic Sriracha Parmesan Wings (P220 for 6pcs/P380 for 12) is nothing short of amazing. Deep fried wings coated in a Garlic Sriracha glaze, and sprinkled with Parmesan cheese. Another winner among the wings was the Aladeen (P380 for 12, PhP 220 for 6) wings. Wings Dry rubbed in Spiced Cumin, Coriander, and served with a Garlic Cilantro Cream dip. Beefy’s Tribeca (P325 for a la carte, P350 with fries) was truly a sight to behold. A triple patty Behemoth, topped with Three layers of Emmenthal Cheese, with Bacon Jame, Onions, and Peppers slapped on, then finished off with Beefy's Supah Sauce. 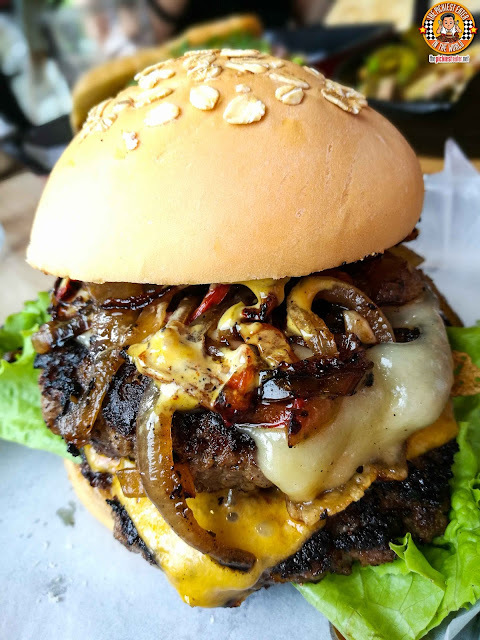 The Notorious (P260 for a la carte, P285 with fries) is a delicious take on the old school type of burger, but on steriods. A double Patty Burger, with two types of cheese slapped on - namely Emmenthal and Cheddar, then topped with Sauteed Onions and Peppers and Beefy's Supah Sauce. Another burger we tried was the The Empire (P260 for a la carte, P285 with fries). 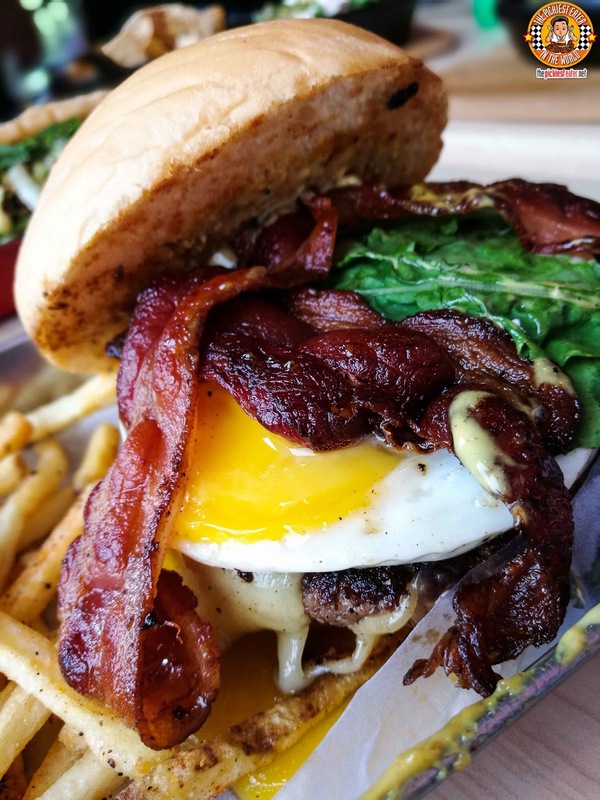 This was a single patty burger filled with fried egg, emmenthal cheese, bacon, deep fried red onion strings, Beefy's trademark Supah Sauce, and Arugula (For less guilt, perhaps?). In case it wasn't obvious to you yet, this was pretty darn delicious. The Franchise (P200) was nothing short of amazing. The hotdog itself had a wonderful snap to it wtih every bite, but Beefy's added even more awesomeness to it by their signature "Gotham Mac", crumbled bits of Bacon, and a healthy toppping of charred Coleslaw. 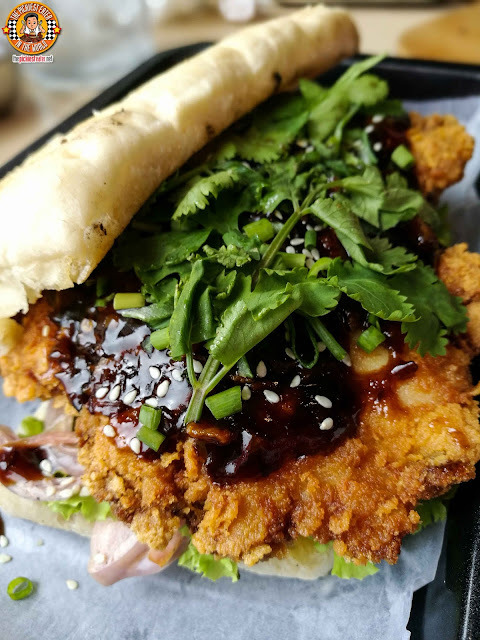 One item I was dead set on trying, was the Tso Fried Chicken Sandwich (P240). 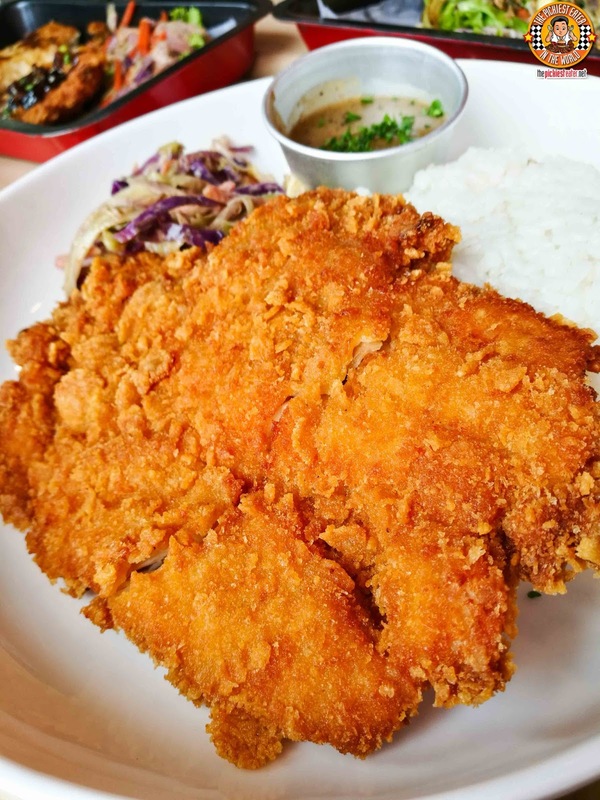 A juicy Chicken Fillet is coated in crushed corn flakes, then deep fried to a golden crisp. The fillet is then slathered Beefy's "Tso" sauce, which perfectly complimented the chicken. That gorgeous Chicken Fillet also plays a starring role in Beefy's Chicken Fried Steak (P200). The chicken was cooked immaculately, and when doused in Beefy's homemade gravy, it was a match made in heaven. 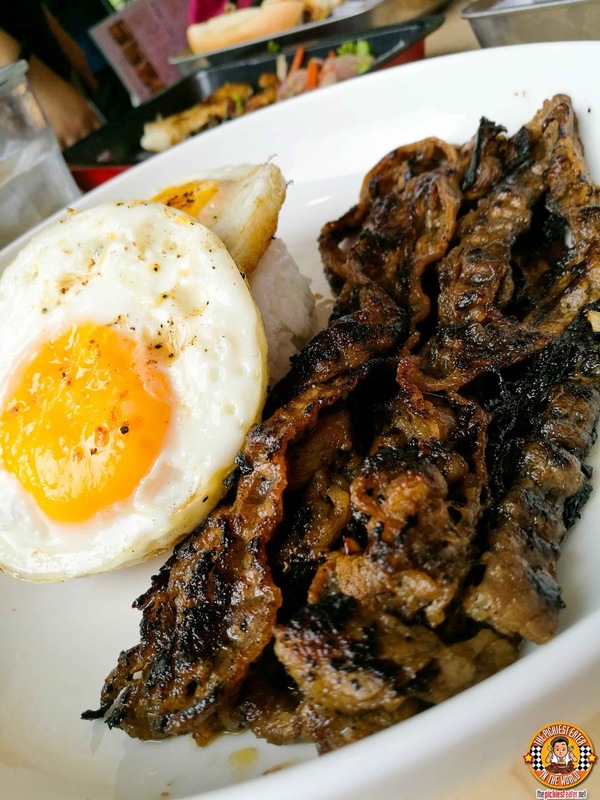 Sure, Beefy's dubs itself as a "New York Grill", but in this country, you're going to need some Pinoy favorites, and The Tapa (P240) fits that bill to a T. Stunning strips of US Beef Shortplate, which is sanskrit for "BEEF BACON", are marinated in those special herbs and spices taht we all grew up with, slapped on the grill and served with Two Eggs and Garlic Rice! I'm a huge waffle fan, so I was really excited to try Beefy's Wiffle Waffle (P160). 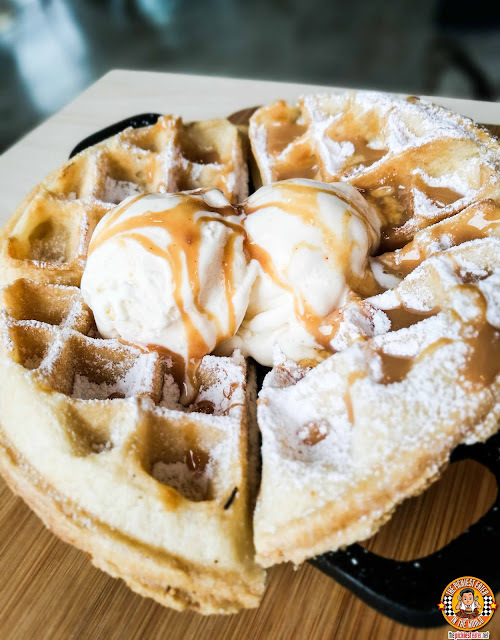 The batter of this Belgian Waffle was spot on, and topping it with Vanilla Ice Cream was an absolute delight. However. 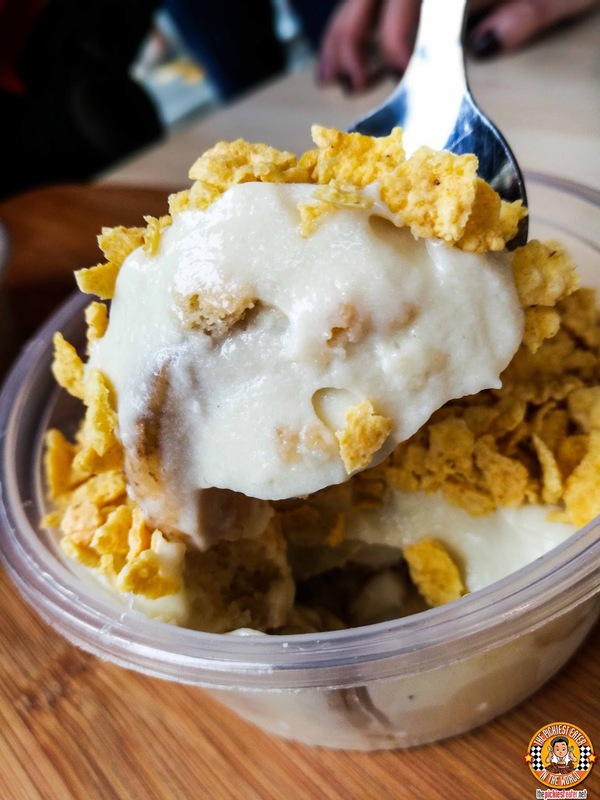 it was in the Cayenne Caramel that gave this classic a modern twist. You get a gentle kick of heat to go with the light sweetness, that interestingly enough, balances each other out! From the moment I laid my eyes on the selection of desserts, I knew I wanted to try the Bananacotta (P120). Made with a silky Banana Custard and layers of sliced banana, Lady fingers and a rich Chocolate Ganache, I found myself wanting to bury my face into this delectable bowl of heaven. Any one of this dessert trifecta would be the perfect way to end your meal! Chef Marc really must be a brother from another mother, because there are so many items on Beefy's menu that I have yet to discover, but all of them seem to scream my name, and cater exactly to my palate! You know how when you make plans to go Laguna, and you think some restaurants that you must pass by on the way to get to where you're going? Beefy's isn't one of them. 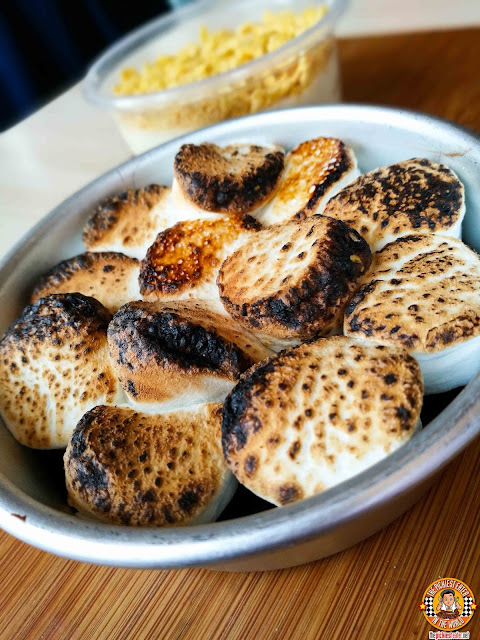 With their amazing burgers, hotdogs, mains and desserts, Beefy's New York Grill is the REASON you make that long drive to Laguna. I am totally looking forward to my return to Beefy's! Like Beefy's New York Grill on Facebook! 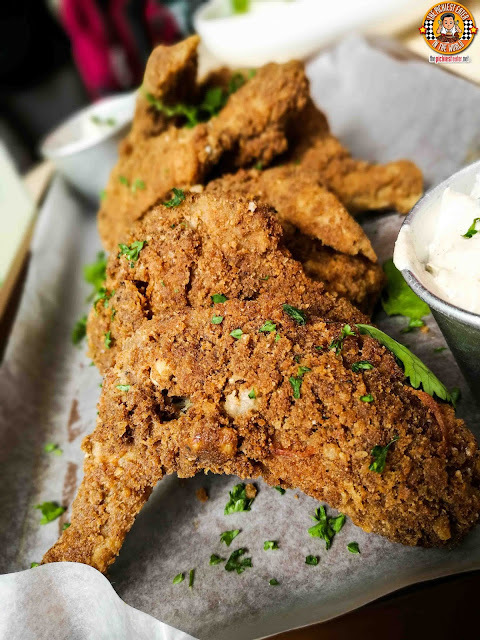 THE PICKIEST EATER VLOG: FOWLBREAD'S NEW MENU!